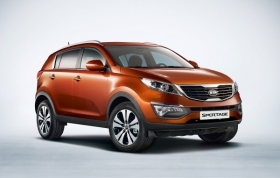 Strong demand for the Sportage has give Kia a big boost in Russia. MUNICH – Chevrolet, Renault and Lada were among the big winners last month as Russia's year-on-year new-car sales rose for the first time since October 2008. Thanks largely to the country's car scrapping program, Russia's total sales increased 20 percent last month to 163,299, according to data from the Association of European Businesses (AEB). Sales through four months were down 13 percent to 456,179 compared with the same period last year. That is an improvement over the 25 percent sales decline seen when comparing the first quarter of 2009 with Q1 2010.
for the scrappage scheme,” David Thomas, AEB automobile manufacturers committee chairman, said in a statement. For example, Kia's sales were up 46 percent in April to 8,331 units and have risen 34 percent to 25,990 cars through four months even though it is not able to take advantage of the subsidy. Kia has risen to No. 3 from No. 8 in Russian new-car sales because of strong demand for the Rio subcompact, Sportage and Sorento SUVs and the Cee'd compact, Kia Motors Russia public relations head Andrey Matveev said in an e-mail reply to questions. The other reason for the rising sales are Kia's competitive pricing and aggressive marketing, Matveev said. Martin Jahn, vice chairman of the AEB automobile manufacturers committee, warned that April's sales results should not be misinterpreted. He said in a statement that the positive signs are not an indication of a return to long-term growth for Russia, which was on track to pass Germany as Europe's largest auto market before the global economic crisis hit. The downturn caused Russia's 2009 new-car sales to fall 49 percent to 1,465,917 units compared with 2008.